Steve can collaborate creatively from conception all the way through to mix down. His 35 years of experience as a performer enables him to direct, coach, coax, encourage and extract your best possible performance. He can play a variety of instruments either live or digitally to enhance that performance. He then works his magic in post and delivers a final product that surpasses your original expectations. Steve listens to what the client says and to what they don't say and uses every trick in the book to make it happen. He can take your old recordings, both live and studio and re-master them, just like the big boys at Time-Life. With a little patience and some great technology and equipment, things like crowd noise, vocal balance, recording times and even pitch can be corrected. Steve painstakingly researches each gear purchase to ensure the he stays on the "cutting edge" of technology. 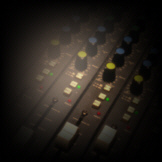 The bottom line is an affordable recording alternative that delivers quality and service. Since Steve can do everything himself, he can offer reasonable rates that make it affordable for Karaoke Singers to make their own CD's right in the studio. He has thousands of songs to choose from, or you can bring your own. Your voice and Karaoke music will be digitally recorded, mixed and mastered onto a Compact Disc (CD). The studio is equipped with all the necessary monitoring facilities so that you can hear yourself and read the words on-screen as you record, just as you would in a LIVE situation. Your CD can be used for any non-commercial purpose. Karaoke recordings make great gifts or keepsakes! They are also perfect as demos for record companies, talent scouts or landing that great club gig. Many of Steve's clients are veteran entertainers and musicians who have taped recordings of their past performances. Since tape has a relatively short "shelf-life" it is important to transfer these special moments to a digital media before they're gone forever! CD's can add up to another 100 years of life to the music. They're more prestigious and generally more desirable than cassette tapes. With his arsenal of digital tricks he can beef up the EQ, pitch correct, fade in or out, even eliminate bad solos and remove tape hiss, pops and crackle. Songs can be placed in any order, (and order does matter!) The final product is a professional looking CD with full artwork, labels, jacket and spine. Sweet! (Of course, we can still do cassette tape, Mini Disc, or DAT, if you prefer.) Your successful recording session depends on good equipment, a comfortable workspace, and creative collaboration. Many clients have described the in-studio experience as "fun". After arriving a bit nervous they leave saying they can't wait to come back and do more. Many artists who bring tapes to turn into CD's return to do professional digital studio recordings that sound far better than their original live performances! If any of this sounds like something you'd like to do, call us. I'm sure we can work out a schedule and price that you will be very happy with. Recording Studio - Call for rates. They're very affordable! Steve Briggs has been recording and producing music since he was a small child. He got his first Sony reel to reel tape recorder when he was only 13 and he's been creating and recording music ever since. He is trained as a classical musician, but his live performance includes all types of music. He specializes in commercial music and sound design for radio, TV and the big screen. Music is not what Steve does, it is who he is. From the consummate professional to the first-timer, Steve is able to provide a cozy recording atmosphere while maintaining the highest level of quality that his clients deserve and expect. Final Note: Steve is dedicated to providing the professional and amateur alike with the highest level of customer service, excellent finished product and best value on the market. Thank you for considering Steve Briggs Productions!